The two baby Killdeers who recently hatched at the Fill have already left their nest — a scrape in the gravel of the Dime Parking Lot — and have begun foraging for themselves under the watchful eyes of their parents. You can see them running on their long legs amid the short grass that borders the gravel. They look like fuzzballs on stilts as they dart here and there searching for bugs and worms to eat. Killdeers are precocial birds, meaning, the babies are born with the ability to move around and fend for themselves almost immediately after hatching. That’s not to say that they can dispense with their parents, however. On the contrary, baby Killdeers depend on their parents to show them the best spots to find food. The babies also rely on their parents to help ward off danger. Crows are always on the lookout for unwary younglings, and the Raccoons and Coyotes who hunt by night wouldn’t say no to a tasty Killdeer either. It’s a chancy world. Parent Killdeers can’t really do much to fight off predators. They don’t have the proper equipment. They lack sharp talons and fierce beaks and don’t carry any permits for concealed weapons. 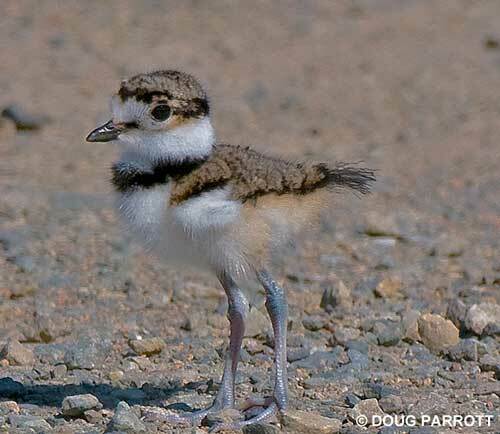 Outside of freezing into a statue and hoping their browns, blacks, whites, and beiges will conceal them from predators’ eyes, Killdeer adults have only one mechanism to protect their young: They pretend to be injured themselves. The parents at the Dime Lot are especially skilled at this. If they think I’m going to threaten their young, one of them will stick out a wing or a tail and drag it along brokenly on the ground, crying piteously to attract my attention. If I follow the “wounded” bird, it manages to stumble ahead just fast enough to keep from getting caught. When it figures it has drawn me far enough away, it leaps into the air, giving its characteristic “kill-EER, kill-EEER” laugh and flounces off, leaving me feeling foolish. “What a chump,” I can almost hear it thinking. I am glad to let it think so. I’m a parent, too, and I sympathize with the birds’ efforts to keep their kids safe, no matter how much they dart out from cover. This entry was posted in Uncategorized on June 9, 2011 by constancesidles.